The radiator overflow bottle on the left is found in early 1970 Skylarks. It has a translucent top while later versions, 1971-2, have black tops. Sometime in 1970, the black top verisons appeared. 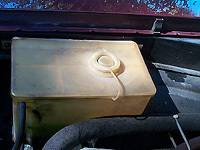 The 1970 washer fluid bottle on left is mounted directly to the LF fenderwell while the 1971-2 washer bottle is held by a bracket mounted to the LF fender just below where the hood meets the fender. 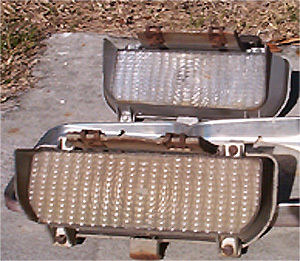 Here is a comparison of 1970 front marker light housing with a 1971-2 (top) . The 1970 is about 1.5" wider than the 1971-2 version and can not be interchanged. This is a side by side comparison of the two different 12 bolts that are found in A-bodies. 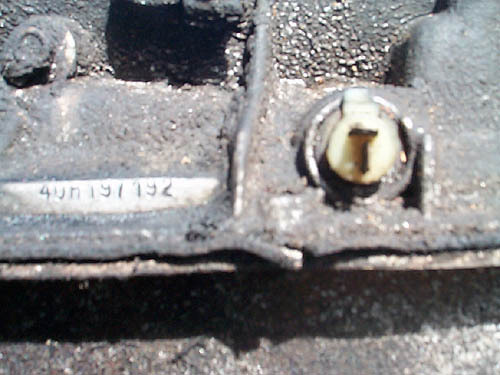 The one on the left is a 12 bolt Chevrolet and can be identified by the oil channel formed in the cover. Also, the 12 bolt Chevrolet is more oval in nature than the 12 bolt Olds on the right. Olds used a smooth cover. Also, the Olds 12 bolt last appeared in 1970. The 12 bolt Chevrolet last appeared in 1972. A note of interest is that Canadian-built Skylarks have 12 bolt Chevrolet rear axles. To identify a Canadian-built Skylark, look at the cowl tag in front of the windshield wipers to see "MADE IN CANADA" at the bottom of the tag. Also, notice both of these rears have a posi ID tag. Here is the posi ID tag. 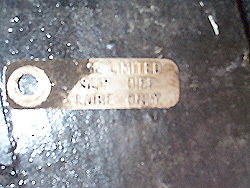 The wording is "USE LIMITED SLIP DIFF LUBE ONLY"
Here is a comparison of 1970 and earlier 16" armrest (bottom) with 1971-2 12" armrest (top). The 16" versions are not being reproduced so they are getting difficult to find. The 12" are available as reproductions and run about $20-25 each. As you can tell in this photo, the 12" is severly degraded and very brittle. No way to save this one except to replace it with a new one. Here is side by side comparison of 1973-77 Regal center console(lower) and 1970-2 Skylark center console (upper). The consoles are identical above the stainless steel belt line. The lower portion on the Regal version is much taller and these can be made to fit in 1970-2 Skylarks by trimming with a sawz-all or jigsaw. The shifter and shifter cable from the Regal will not work in a 70-2 Skylark. The Regal shifter handle is the same as the 1970-2 versions except the handle is black while the 1970-2 handle is a simulated woodgrain. 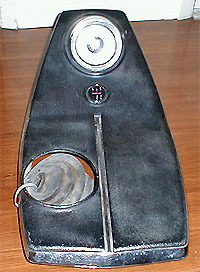 The Regal shifter handle can be used in the 1970-2 Skylarks. 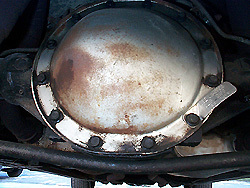 This is a photo of a 67 disc brake hub cap similar in style to the ones found on Corvettes of the same year. 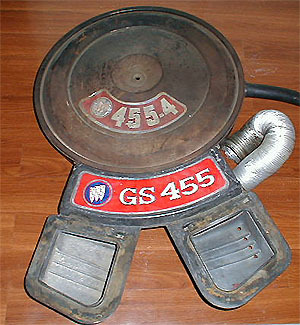 Here is a picture of a 1970-1 GS air cleaner. Note the 455-4 decal on the lid, this is incorrect for GS models. Also note the scoops are both squares. In 1972, the driver's side or right one in this photo would be a triangle which was changed to account for the introduction of the AIR pump which was located above the ps pump on the driver's side. This is a 71 Skylark grill and they are getting very difficult to find. It is all plastic just like the 70 GS grille. This is a 71 GS grille and is made of plastic. This one is missing a portion of the upper horizontal rib. 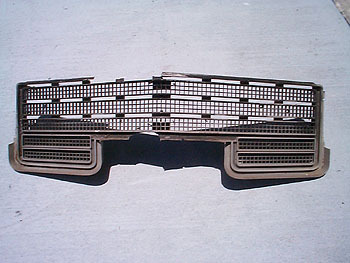 The design is similar to the 72 Skylark Custom grille below. 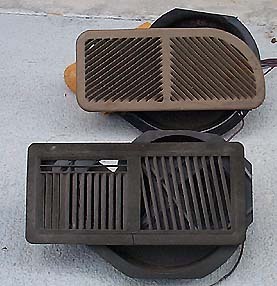 This is a 72 Skylark Custom grill and is made from pot metal. This is a 72 Skylark and GS grille. It is all plastic. Thankfully Skylark and GS used the same grille so these are a little easier to find. 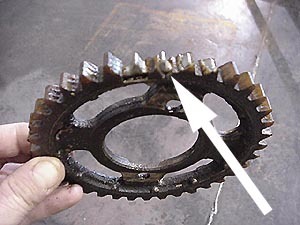 This is a 4 speed consolette and is found on 1968-72 cars. They are identical for each year. The round portion at the top was used for tachs in 1968-9 since there was no place to install a tach in the instrument cluster. This is a medium console and was placed between buckets for column shifted cars or 4 speed cars. This is a 1968-9 console and is quite different than the 1970-2 versions. Here are a couple 8 track players. The one on the left is from 1972. They were mounted to the bottom of the dash. This is a 1970 driver's side mirror. 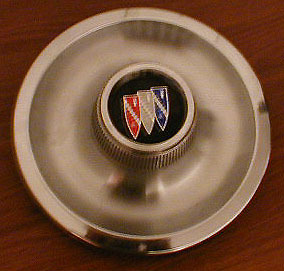 The tri-shield found on the back of the mirror head was only used in 1970. 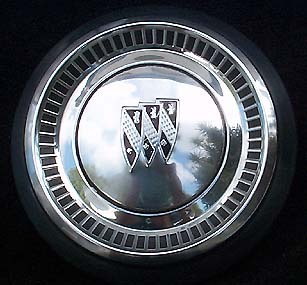 In 1971-2, the mirror did not have the tri-shield. 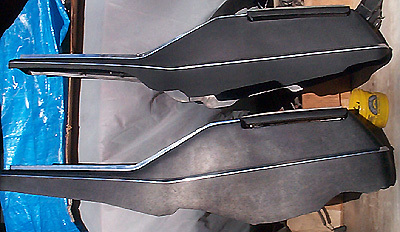 The top manifold is from a 73 455 car and is typical of 1968-up exhaust manifolds. 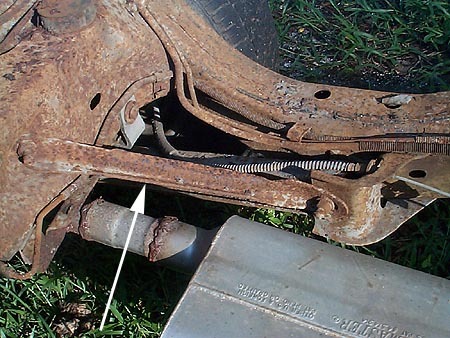 The depression between #5 and #7 exhaust ports was to clear the power brake booster. 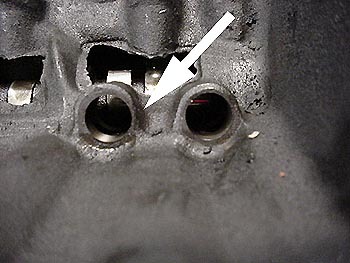 The manifold on the bottom is from a 67 430 car and does not have the depression. The bottom manifold actually flows better, they are sought after by stock appearing racers for better performance. This is a good example showing what happens when you run water for coolant. 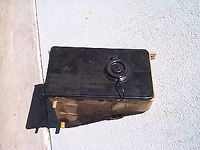 Always run anti-freeze or suitable fluid for coolant since the timing cover will erode with water use and lead to pinhole leaks. This is the factory cam sprocket. 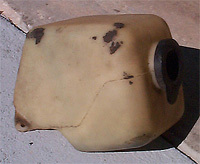 As the arrow indicates, the nylon portion has worn away. This is very dangerous as the nylon particles soon collect in/on the oil pick-up screen and leads to oil starvation. Engine failure occurs soon after. Replace with a double roller chain and gears! This is an example of core shift during casting and leads to a weak block. This may be fine for regular street car but any type of performance build up would lead to structural failure in this block. There is very little material to hold the lifter in place and this block should be discarded in favor of another block. Here is a pic of two rear defrosts. The top one is from 1970 and has a metal grille. 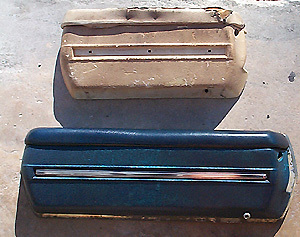 The lower is from 1971-2 and has a plastic grille. 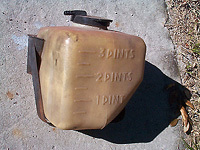 Here is pic of the standard hubcaps called "dog dish" or "poverty" caps. 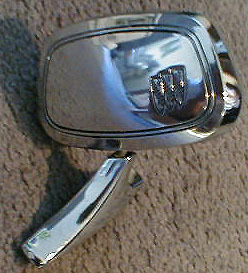 Early versions were chrome plated steel and later ones were aluminum. to the frame using the upper and lower control arms for the rear axle. 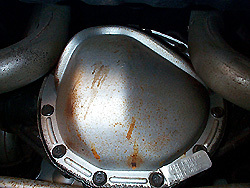 These are usually found on performance models such as GS, GTO, 442, SS. Here is a pic showing the VIN on a TH400 for a 70 GS455.